Andre Toulon and his living puppets are hiding from the Nazi’s that are pursuing them for a magic elixir to bring inanimate objects to life. To save his secret, Toulon hides the puppets inside Bodega Bay Inn’s walls and puts a gun to his head. Fifty years later, four psychics are summoned by another psychic friend who has found the secret and unleashed the puppet’s fury. The story begins as four psychics are summoned telepathically to the old Bodega Hotel by their partner, Gallagher (Jimmie Skaggs). For years, they have been chasing rumors that a puppet master named Toulon had uncovered the “secret of life”. As the four arrive, they find Gallagher has killed himself. Confused and a little suspicious, they decide to search the hotel for the puppet master’s secret. One by one, the party is eliminated by the puppet master’s creations: Blade, Pinhead, Tunneler, Leach Woman, and Jester. But why??? The end comes as Gallagher back from the dead reveals that he has succeeded in finding Toulon’s secret of life and in fact, is living proof. No longer needing the puppets, he turns his back on them. Betrayed by their new master, the toys seek their unmerciful revenge. 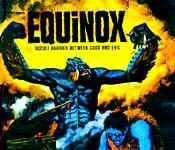 One of the most original and imaginative horror films of the late ’80s. This was one of Full Moon’s first breakthrough films and has spawn 5 sequels with rumored series called “Puppet Wars” (The Puppets vs. Demonic Toys) coming in the near future. I also want to take this time to ask the fans to continue supporting everything Full Moon does, because they are one of the few studios showing a dedication to the genre. Way to go Full Moon …keep it up!!! 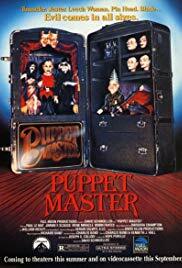 Full Moon’s classic movie, Puppet Master, is most likely their only masterpiece. The first shot of Blade running throughout the hotel to his creator Toulon was a fascinating scene to the open during the credits. The credits also have the magnificent Puppet Master theme song that is one of my favorites in the horror genre. The music really sets the atmosphere for this type of fun carnival feel of a movie but it still produces a creepy vibe. What really makes the movie is the characters being both the humans and the puppets themselves. Each human has their own different psychic power and the puppets have their own identity and uniqueness. The main protagonist, Paul Le Mat, was a terrific choice as Alex Whitaker, but it was Irene Miracle who stole the show. Miracle played Dana Hadley, who was extremely attractive and played a fabulous eccentric role in the film.